Brad San Martin, a Boston-based musician, has been active in the indiepop community for years, though he’s probably best known for his role in One Happy Island. Brad released an EP for February Records back in 2010 under the name Secret Charisma. We wanted to catch up with Brad and see what’s been going on in his musical world since that release. And a lot has happened! From One Happy Island line-up changes, various recording projects and live albums, to the end of WeePOP! Records, Brad kindly shares his story with us. March, April & May: This description of Secret Charisma is pretty charming: “Secret Charisma is Brad San Martin, who is always doing something or other.” What are you currently involved in? Brad San Martin: I have to admit that I wrote that a long time ago … although I guess it remains accurate. Right now, all musical efforts are going toward finishing the new One Happy Island record, which is in the mastering and artwork stages — which are the two stages I am personally the worst at. I lean really hard on Shannon for mastering, since he has the best ears for sounds and frequencies, and is also very well-versed in studio technology and processes. Meghan has a fantastic visual sensibility, so she’s become the go-to person for artwork and design. Most of the time, I have multiple musical projects going, but at the moment, it’s a little quiet. I quit a lot of stuff to focus on One Happy Island and just life in general. So my sideman and extra-OHI commitments are minimal. I’ve spent a fair amount of time lately getting my little attic studio operational, and figuring out a way to record that mixes analogue tape and digital media that works for me. I wouldn’t say it’s high-fidelity, but it certainly has a nice vibe to it, and I look forward to spending more time up there. My girlfriend also has a craft studio next door, so that’s an added bonus. M,A&M: One Happy Island recorded a live album, titled “Your Flaws Aren’t Picturesque,” over the course of two nights in Somerville, Massachusetts. What was the experience like for you and for the rest of the band? Brad: I can’t speak for Shannon and Meghan (you’re welcome to ask them — they are awesome human beings! ), but for me, it was exhilarating. The concept of recording an album as though it were a concert was Shannon’s, and I feel it was a great one. I think that, in concert, One Happy Island is looser, funnier, more emotional, and more freewheeling than we are in the studio. We’re less likely to second-guess ourselves and more inclined to just go for it. Also, by the time you deal with all the logistics of a show — soundchecks, getting good opening acts, finding a venue, drawing a crowd — the performance is something of a release and a relief. This album really benefits from all of the above. That said, we were writing material up until the day of the show. It was intense and nerve-wracking. We knew we only had two shots to get takes that we were happy with. It was a risk, but one I’m glad we took. These days, even the most DIY bands use a lot of studio sweetening … this seemed like an honest way to document what we feel makes this band unique. Also, to me, recording an album with friends and family along for the ride really spoke to the wonderfully communal nature of indiepop. M,A&M: I’m also a bit curious, since both members of February Records were at the second night of the live album recording sessions. Listening back now, do you feel as though there was one night that was stronger than the other? Brad: The resultant record has tracks from each night … they were both so different. Oddly enough, the crowd on the first night was smaller but louder. Night two had a bigger audience, but they were quieter. That changed the energy a lot. The first night had solid takes, and knowing that we had good versions of the songs in the can made us take a few more chances on the second night … we pushed things a little more. I wouldn’t say one night was stronger than the other, but they each had their own character, and the vibe of certain nights complemented certain songs better. M,A&M: You mentioned that you really lean on the other two members of One Happy Island for mastering and design when it comes to the albums you release. Did the band produce their own artwork for the new album? Brad: The artwork for the new record is still in progress, but it is a collaboration between Meghan and her sister Melissa. Melissa has done the artwork for the past two releases, and no matter the medium — for “Unsummer” she did an illustration, for “A Purpose of the Surface” she did a fantastic collage — her work never fails to surprise and delight. I can’t wait to see what they come up with for this record. M,A&M: Kind of leading off of that, how does the DIY sensibility fit into the One Happy Island dynamic? Has it changed at all through the line-up changes you’ve had over the years? Brad: Well, the waters we swim in are inherently DIY: All the bands and presenters and labels we’ve worked with stress that. Everyone makes their own flyers, there are a lot of hand-drawn and hand-assembled releases (which WeePOP! pioneered), and because what we all do is not super mainstream, we tend to do our best show in non-traditional venues that we, or our friends and fellow bands, book and promote. Perhaps contrary to the usual band trajectory, One Happy Island has gotten more and more DIY as the years have passed. Part of that has to do with going from four people down to three. And part of that has to do with wanting to capture a more live, immediate sound, meaning that our last three records — including the upcoming one — have almost no overdubs. Bringing Meghan into the band added a great deal musically, and also allowed us to control the artwork more ourselves. We’ve also learned to work well in any circumstance: We don’t need a PA system or even electricity to have fun and put on a good show. We’ve done a few totally acoustic things, like in Sheffield and at Weirdo Records in Cambridge, and both were great nights. Also, we can all fit into one car, with our gear. I’m starting to see a lot of typical band trappings as extraneous. Maybe it’s because of the rise of technology or the decline in live music, but audiences seem to get the biggest thrill out of just seeing people sing and play instruments in a room. One of the more obvious reflections of our DIY sensibility is that we utilize lots of little instruments that are available to everyone. Not everybody has access to big banks of synthesizers or horn sections, but anyone can grab a ukulele or a xylophone and make music. I think that bridges the gap and brings people into the music. We joked a lot before we made “A Purpose of the Surface” that we wanted to demystify music-making … I’d like to think this sensibility would have prevailed despite the lineup changes, but there’s no way of knowing! One of the key things with One Happy Island has always been to mix experienced musicians with non-musicians. It would be easier to just find slick folks who can play effortlessly to make music with, but that’s so boring. Mixing experience levels, which we’ve continued to do in all iterations, poses certain challenges, but the resultant art is so much more interesting for everyone. M,A&M: “Your Flaws Aren’t Picturesque” is now one of the three releases that WeePOP! has established a Kickstarter for prior to the label’s retirement. You’ve released several albums through WeePOP! over the course of several years. Is it bittersweet at all to be one of the last releases? Brad: “Bittersweet” is certainly the word. The experience of being associated with WeePOP! was extraordinary. It took a band that started in a bedroom in Brookline, Massachusetts, all the way across the ocean, and introduced us to wonderful people and musicians we never would have met or heard. I still marvel at the wonder of it all, and at Camila’s graciousness, dedication, and ingenuity. But we’re all growing up, we’re all changing, and life is ongoing and evolving. In the five or six years since we started playing music and making records for WeePOP! (and other awesome labels, like OddBox and Sheffield Phonographic), so much has happened: Marriages, children, jobs, divorces, moves, lineup changes, and more. WeePOP! winding down is another one of those changes that, with the passage of time, seems inevitable. I like the idea of going out with three cool vinyl releases by a group of friends whose friendship has grown stronger thanks in no small part to WeePOP! I guess now would be a good time to encourage anyone reading this to check out the Kickstarter campaign. We’re getting close, and could use your help to get there. M,A&M: As a musician, how do you view these Kickstarter campaigns? M,A&M: Rumor has it you played on Colin Clary’s newest album, which is also part of the WeePOP campaign. How involved were you in the making of that album? Brad: Making that record was a dream come true. As I understand it, Colin had written a batch of songs really quickly, all around the same time. They cohered and complemented one another in a really special way, so he wanted to record them with a core band of people he was close to. He sent demos to myself and Brad Searles, who is a great drummer and all-around awesome guy that Colin has known from Vermont days. I played bass, which is really my first instrument and the instrument I’m best at, even though I hardly play it anymore. We had two rehearsals and then made the record in two days. Once basic tracks were done, I was able to add some ukulele, banjo, keyboards, and mandolin. Colin could tell we were all on the same page, and trusted us instinctively. That trust really moved me. Gary Olson produced and engineered the record. It was a full-circle experience for me, as the Smittens and Gary’s band, Ladybug Transistor, were two of the first indiepop bands I saw as I was discovering the music. I never thought I’d be in a studio with Colin and Gary like this, so it meant a lot to me. M,A&M: It has been mentioned that “Your Flaws Aren’t Picturesque” may be the last album for One Happy Island. Do you think you’ll continue releasing music under the Secret Charisma name? Brad: We haven’t really formally called it a day with One Happy Island, but it’s true that one of us moved away, so regular rehearsals, recordings, and shows are largely out of the question. But we haven’t ruled out doing some special shows, especially if/when this new album comes out. That said, I’m not really sure what comes next. I may start a new band, revive the Secret Charisma enterprise, or just (gasp!) use my own name. I have a bunch of songs, and the studio is pretty much ready to go … but, honestly, after years and years of hustling gigs, intense planning, touring, recording, and the like, it’s nice to take a deep breath and just relax. But the compulsion to write, record, and play is just below the surface. I can feel it. M,A&M: What do you find yourself listening to these days? Brad: I’m an obsessive digger. I love flipping through crates at flea markets and yardsales, and spending a few bucks on anything that looks weird or interesting — strange small-press records of college ensembles, regional polka bands, stringband music, anything. The gem-to-blah ratio isn’t so great, but the finds are so bizarre and inspiring (and are usually cheap) as to be worth it. So these days, it’s kind of a blur of weirdness. I do mix in a fair amount of indiepop, but no more than jazz, bluegrass/country, soul, or weird rock offshoots. That question gets harder and harder to answer every day! My “to listen to” pile is out of control, I’m afraid. One Happy Island, alongside Colin Clary and Let’s Whisper, is releasing an album on WeePOP! Records before the label’s retirement. One Happy Island, as well as Secret Charisma, have been a part of the label for many years. Please consider visiting the Kickstarter campaign and helping WeePOP! “go out with a bang.” The campaign ends on November 27th, so don’t miss your chance to support not only a label that’s been incredibly unique and lovingly DIY from the very start, but musicians to which the same sentiment rings true. Interview conducted via email and compiled by Kristin Gill. Photograph by Amber Duntley. Photo illustration by Dan Goodwin. February Records is very pleased to announce that we will be dipping our toes into the world of zines. Having included exclusive interviews as part of our latest digital releases, we feel this is a logical step forward as an extension of the label. The zine, which will launch this week as a series of interviews on our website, will be titled “… march, april & may” — a natural progression of February Records. We hope to transition to a physical publication in the near future. 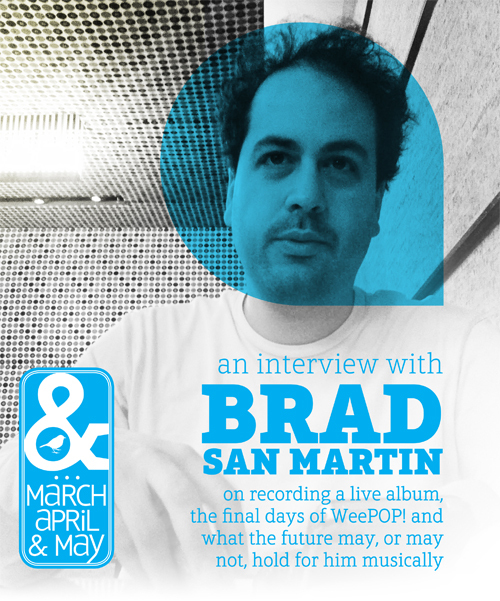 Our first interview is a conversation with Brad San Martin (One Happy Island) about recording a live album, the final days of WeePOP! and what the future may, or may not, hold for him musically. Brad released a single on February Records as Secret Charisma in 2010 and was also featured on our “One Year Of Original Music From February Records” digital compilation. “March, April & May” zine #5: 80 pages of essays and interviews with Tracyanne & Danny, Night Flowers, Famous Problems, Sushi Backpack, Odd Box Records, Mini Dresses, Math & Physics Club, Gabardine and The Courtneys. — plus more. Order here. Most February Records releases are now exclusively available through Bandcamp for free download or streaming.